Stock photo of Toronto's skyline at night as seen from Centre Island across Lake Ontario in the Toronto Islands. Toronto City Skyline seen at dusk from Centre Island, Toronto Islands, Lake Ontario, Ontario, Canada. 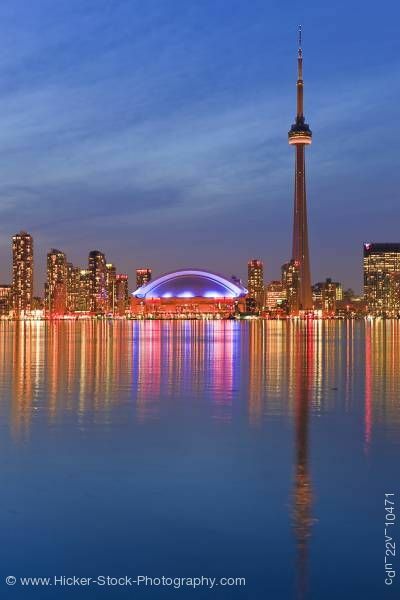 Deep blue sky streaked with white clouds sits behind the skyline which includes the CN Tower and an arena on the waterfront which appears illuminated in purple light from within. Long streaks of light in yellow, orange, blue, and pink shine across the calm still water of Lake Ontario in a scene taken from Centre Island.